You are here: Home / Photography & Videography / Why Buy a Camcorder? On my iPhone, I can shoot video. I can edit, too. I can shoot video on my camcorder, but I can’t edit (not easily, anyway). And that got me to thinking about just what I might want or need in a standalone video recording device. Although you can find camcorders that record onto videotape or DVD, the standard recording format is now the SD card–the same type of card used in most digital cameras, but with far more available storage capacity. Less than $200 buys a pocketable video camera and recorder, similar in design to the Flip camera that was popular a few years ago. 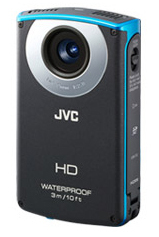 JVC sells about eight different models, all quite similar to the Flip cameras and to one another. All shoot HD-quality movies, 5MP still images, and easily transfer creative work to a nearby computer via USB connection. The GC-WP10A is especially appealing because it’s waterproof, records time lapse, includes face detection, a 3-inch touch screen, and an image stabilizer to reduce shaky videography (which is a common problem with small hand-held cameras). Compare it with JVC’s GC-FM1BUS, which shoots 8MP still images and offers an HDMI output to digital TV screens, but lacks face detection. Spend fifty dollars less, and you’ll save money but sacrifice some features. If not JVC, you will find similar products from Kodak, Samsung, and lots of other companies. In this price range, there will not a tremendous difference in features or reliability. 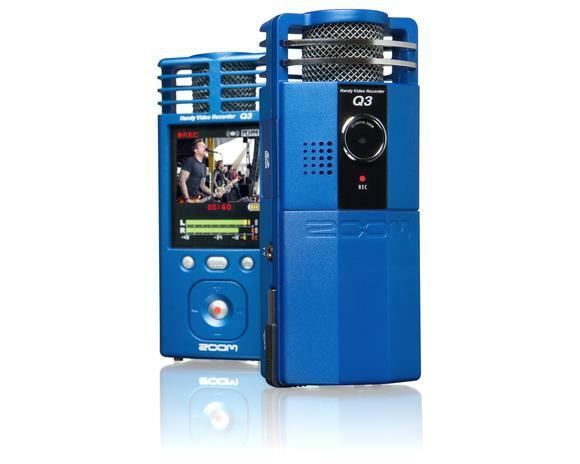 If you’re heading in this direction, be sure to check out the Zoom Q3--made by a company now well-known for high-quality portable audio recorders (which I will write about in a future blog post). I really like the design of the Q3–and its emphasis on audio recording. For a few hundred dollars more, you can buy similar camcorders with interchangeable lenses. But wait! That’s just the beginning!! 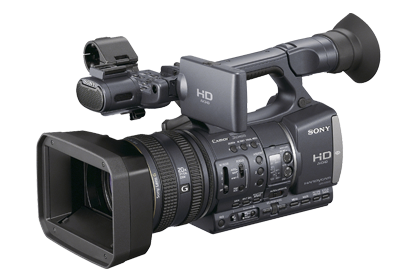 For professional quality results, plan to spend about $2,000 for a model similar to Sony’s HDR-FX7. The big difference between these lower-priced pro models and lesser lights is three-fold: image quality, technical capabilities, and creative control. Image quality is easy to understand, and easy to see. The sensor and the associated image processing technology is superior to lower-priced models, and so is the lens. The viewfinder offers more detail, better contrast, more accurate color, and more detailed information about camera settings. The lens is, roughly, a 20x optical zoom. The zoom controls are smooth, and can be handled with nuance. Jump to the $3,500 model HDR-AX2000 for professional XLR microphone connectors, even better image sensing and processing, and vastly improved low-light shooting. You could shoot a television series for a cable network with this camera. In fact, many professional production companies now use these cameras–and others like it–for just that purpose. Look for a post about dual system audio recording in the near future. So: which camcorder is right for you? If you shoot a few minutes of video from time to time, and post your output on the web, then you may be able to use your smartphone. If you shoot some videos, and some still pictures, and you really don’t need high quality audio, or even a microphone for the occasional interview, then you can use a recent vintage digital still camera. If yours is more than 2-3 years old, it may be time for an update if you want to shoot video. If you are serious about still photography and videography, then you should consider a digital SLR, with its long zoom lens and substantial body size. Although most digital SLR bodies include a built-in stereo microphone, your work will be better if you attach a stereo microphone, or shoot “double system” with an entirely separate audio recorder (the topic of a future blog post). In fact, it makes more sense to invest in a digital SLR than a standalone camcorder in the $300-$1,000 range. These are useful if you shoot a lot of video–but you can do the same, with greater flexibility–with a digital SLR. 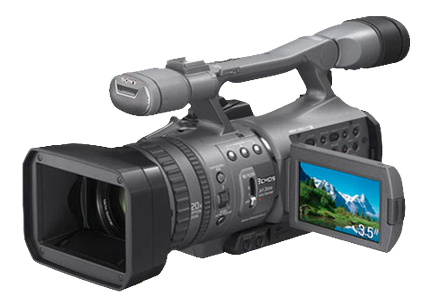 If you serious about videography, then a serious prosumer or low-range professional camcorder is the appropriate choice. Most people who use these cameras devote considerable time to video editing–the camera alone isn’t going to make anyone a star. Fortunately, video editing software is now widely available at reasonable prices. Unfortunately, professional quality video editing requires a lot of time and careful work. With any of these HD camcorders, the work can be stunning. For the best results, professionals rely on quality lenses, sensors, image processing and microphones.